Last week I had the pleasure to extensively test ride a Soma Buena Vista mixte that our fellow bicycle-obsessionist Somervillain has just built up for his wife. This test ride was a rare opportunity that I gladly seized. First off, Soma only sells frames and not complete bikes, so finding a way to test ride their models is difficult. Moreover, this mixte is an especially rare specimen, as it is built up with 650B wheels. And finally, I was allowed to borrow the bicycle for an entire day - which, of course, was much more informative than a brief test ride. I hope this will be of use to those considering this bicycle. 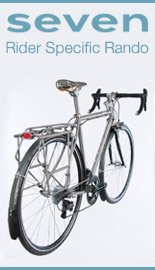 Soma Fabrications is a small manufacturer of bicycle frames and components based in San Francisco. Their Taiwanese-built frames are steel and more or less classic, with modern elements. The Buena Vista model is a TIG-welded mixte with twin lateral stays, available in four sizes from XS (42cm) to XL (58cm). It is a versatile frame with "sports touring" geometry that can be built up either as a roadbike or as a city bike, either with a derailleur or with an internally geared hub, and either with 700C or with 650B wheels. Though a 700C build is by far the more typical, Somervillain fitted this bicycle with 650B wheels. The 650B size allows for wider tires - specifically the fantastically cushy Grand Bois Hetres, which make for a very comfortable ride. Soma specifies a maximum 38mm tire width for 650B wheels on the Buena Vista, but their estimate is overly conservative: The 42mm Hetres fit fine, including fenders. That is a useful piece of information for those who like wide tires and are choosing between, say, the Soma Buena Vista and the Rivendell Betty Foy. These two frames allow for the same tire width. An additional benefit of using 650B wheels on the Soma, is that it is a useful trick to eliminate toe overlap - at least on the 58cm frame. Keep in mind also that when you put 650B wheels on a frame, you can go with a larger size than what you normally ride. While a 58cm frame is usually too big for me, I was able to fit this one because of the 650B wheels. The Buena Vista is available in white or graphite, and this bicycle is obviously the latter. The graphite is a dark silver colour with some depth to it, not unlike a Tahitian pearl. 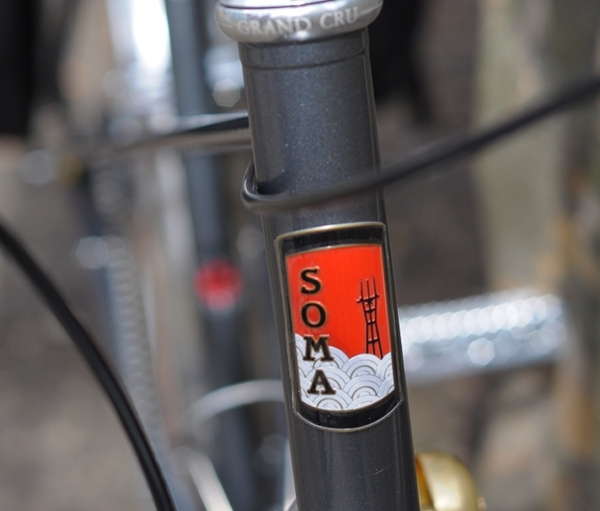 The Soma headbadge and decals are embellished with splashes of red, which I think complements the frame nicely. Gray and silver frames can be tricky to accessorise, and personally I prefer them paired with warm tones. This bicycle is fitted with all black accessories, which gives it a sporty/stealthy look. Ultimately, these choices are a matter of personal taste. 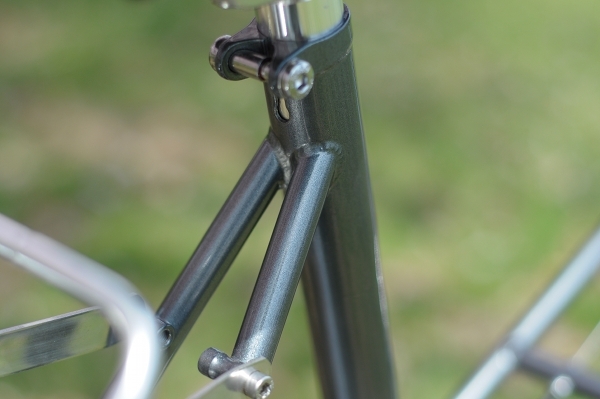 The Buena Vista frame is mostly welded, with the exception of the lugged fork crown and a few lugwork-like details - such as the connector between the stays and the seat tube. The welding is relatively clean, though not quite as clean as on the Surly frames we recently examined. 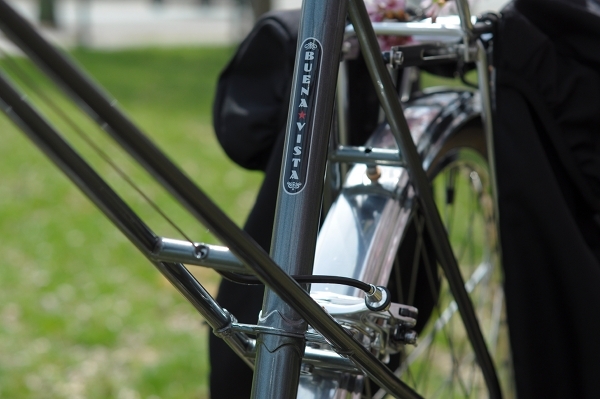 I think that welding marks are more noticeable on a mixte than on a diamond frame, simply because there are more joints to connect. The horizontal dropouts are what makes the Buena Vista frame compatible with both derailleur and hub gearing. 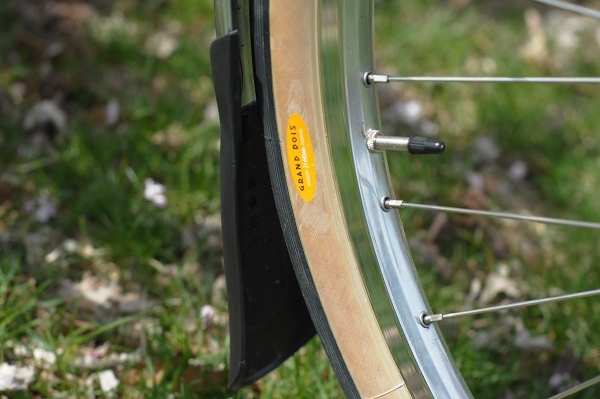 There are braze-ons for both racks and fenders. The wheelset is from Velo Orange, built around a Shimano Nexus 8-speed hub. 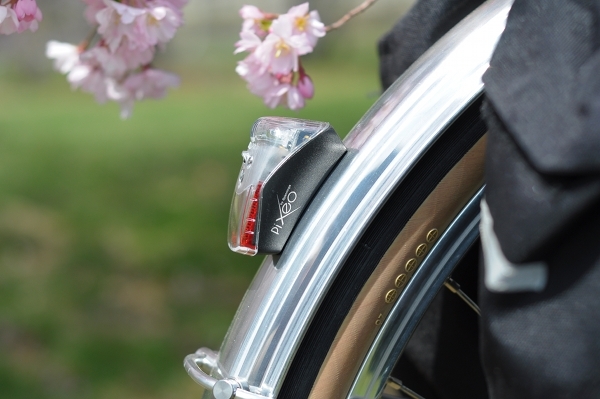 This particular twist shifter is unobtrusive and easy to use. 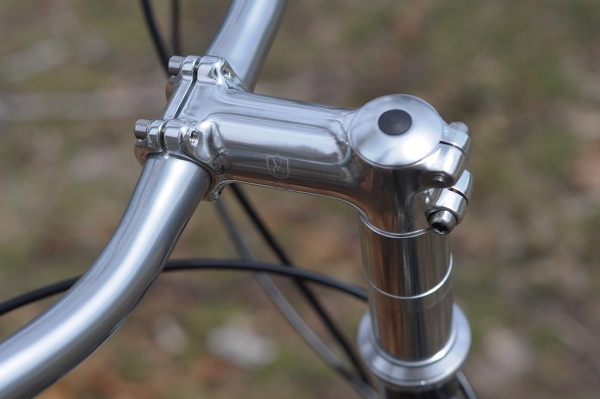 The Nitto Albatross handlebars are set high with the help of spacers - the stem being threadless. Vintage Shimano levers activate the long-reach caliper brakes. Close-up of the Velo Orange threadless stem with spacers. Battery-operated CatEye headlight, attached to the fork blade via a DIY mount. Spanniga Pixeo tail light, attached to the rear fender. 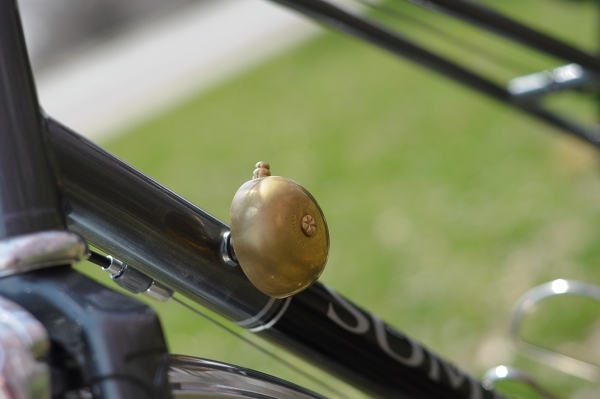 Brass bell mounted on the unused downtube shifter boss. Vintage Takagi crankset, chosen for its ability to accommodate a Porteur-style chaincase that this mixte may be fitted with at a later stage. 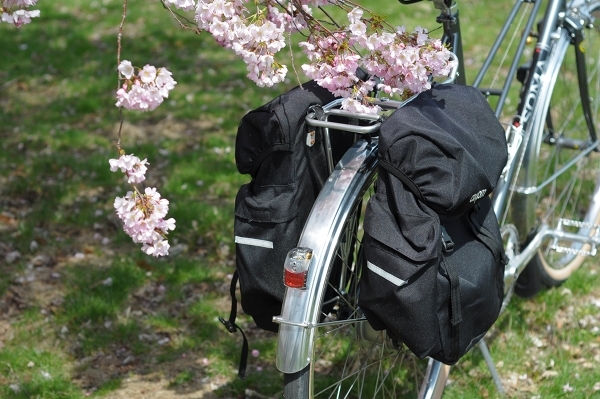 Burley Moosehead rear rack, necessary for attaching a "trailercycle." 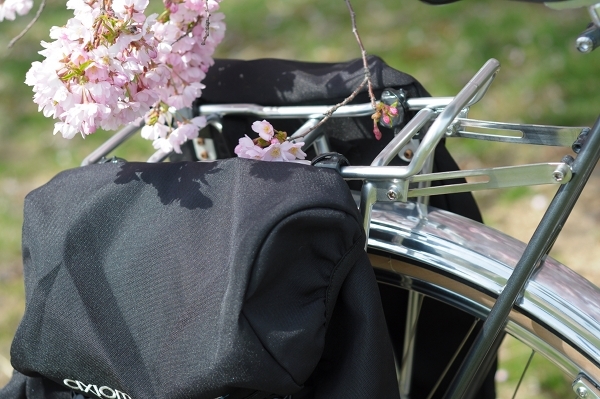 And a set of Axiom panniers, mounted permanently to the rack. Velo Orange fenders and Planet Bike mudflaps finish off the build.The total weight of the bicycle with this build is 28lb not including the rack and panniers, and 35lb including them. The significant difference is due to the hefty nature of the proprietary Burley rack, which was a must as Mrs. Somervillain will often commute with one of the children. 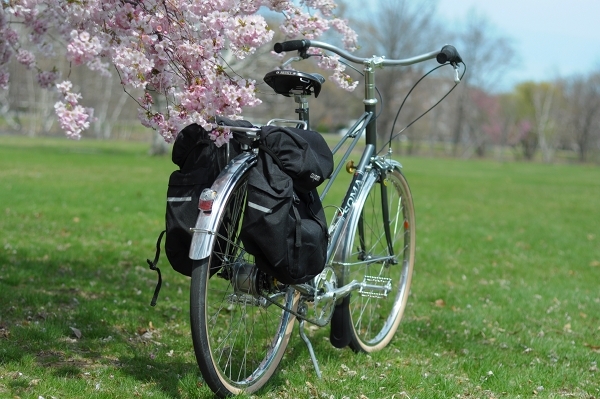 This particular Buena Vista was built up as predominantly a transportation/ utility bicycle, to be ridden mainly within greater Boston - while at the same time offering sufficient versatility to handle longer, recreational rides. Hub gearing was chosen for ease of maintenance and an upright posture was chosen for comfort - with the mixte's roadish geometry still offering sufficient speed and maneuverability. I was in possession of this bicycle from 8:30am until 5:30pm on a weekday. 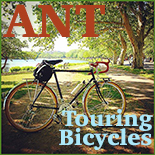 During this time I rode it for transportation to various destinations, then took it on a 12 mile ride along the Charles River Trail towards West Newton and back. All together, I probably rode the Buena Vista for a total of 17 miles. Based on Soma's online description, I expected the handling to be aggressive - but it was not. It did not handle like a "converted roadbike" as some mixtes do, but like an actual upright city bike. Given that I had the saddle lower than Mrs. Somervillain, the handlebars were too high for my taste and the front end felt lighter than I like. Still, I felt safe and confident riding this bicycle in traffic right away. The Buena Vista was maneuverable and responsive - but easy to control, and predictable. The frame felt stiff-ish, but the wide Grand Bois Hetre tires took the edge off, making for a comfortable ride on and off road. It must also be noted that this bicycle was put together impeccably - which greatly contributed to my feeling of safety and comfort on it. As far as speed and hill-climbing go, I must say that I felt somewhat limited by the overly upright posture and the hub gearing. On flat terrain, I had trouble finding a "perfect" gear on the 8-speed hub and kept shifting back and forth. On hills, I thought the bicycle lost its momentum quicker than is typical for a bike with roadish geometry, and I had to downshift sooner and more frequently than I expected. Perhaps I am simply accustomed to mixtes that are set up more aggressively, or perhaps there is something about these multi-speed hubs that I find inefficient in comparison to derailleurs. But given how tamely this bicycle handled, I found myself wishing it were a loop frame - so that it would be more comfortable to mount and dismount. At the same time, given its mixte construction, I found myself wishing it were more aggressive, so that I could cycle faster long distance. In a way, I felt like I was neither here nor there - though I imagine others might describe this very same feeling as "the best of both worlds." Of course, it is entirely possible to fit the Buena Vista frame with a derailleur and to opt for an aggressive handlebar set-up, if that is what the owner prefers. 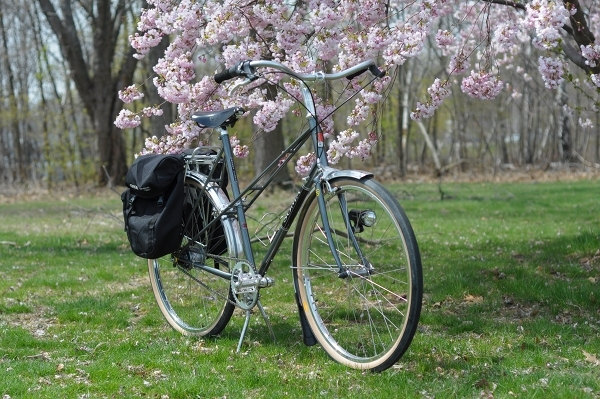 I have test ridden only two other modern-production mixte bicycles besides the Soma: the Rivendell Betty Foy and the Trek Belleville WSD. The Trek is not even in the same universe, and on just about every level I can think of the Soma is a better bike. The Rivendell, on the other hand, is a more comparable bicycle, and I even test rode the Betty Foy in the same frame size and with the same wheel size as the Buena Vista. Though over all, the Betty Foy is a more comfortable ride, the difference is not as great as I had anticipated. 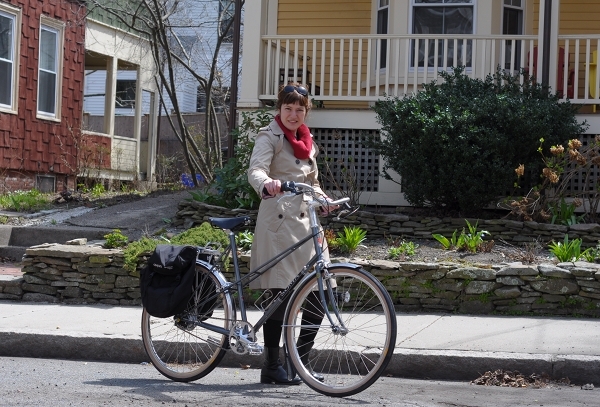 The Buena Vista is a bit harsher on bumps, and the stepover height of the mixte stays is a good inch or two higher than on the Betty Foy of the same size. But otherwise, they did not feel like radically different bicycles. All in all, I found the Soma Buena Vista to be a solidly constructed, versatile frame with comfortable geometry and all the accommodations necessary to turn it into almost any sort of bike you wish. I like the proportions of the 58cm frame with the 650B wheels, though cannot speak for the other sizes. I like the multitude of braze-ons and the wide clearances that allow for my favourite tires. I like the rich graphite frame colour. On a mixte with such classic lines, I dislike the welding and the threadless stem, and for me personally this is a dealbreaker - but I recognise that this is a matter of taste. The Soma Buena Vista frame can be found starting at $400, and a complete bike with a build equivalent to the one shown here could cost as little as $1,200 (see here for the complete build). While everyone's idea of what constitutes "good value" differs, this could certainly fit the bill. More than anything, I recommend this bicycle for those seeking an economical way to build up a bike with 650B x 42mm tires. In that sense, the Buena Vista is a rare and excellent find. I'm guessing the loss of momentum on hills had more to do with the 42mm tires than with the frame geometry or hub gearing. When I switched from 32mm to 50mm tires on a bike it pretty much erased my momentum on hills. That's just the nature of fatties. Somervillain, did the headset come with that rubber stopper in the headset bolt hole? It looks like an attractive, above-average grocery-getter...and a pretty good value as well. Thanks for writing about it! did the headset come with that rubber stopper in the headset bolt hole. Yep, it did. With the caveat that this commenter's favorite bike is a customized old Schwinn Suburban, I think this bike overall is rather attractive looking. Dennis, I'd say the sum of the parts on this bike is significantly superior to that of an above average grocery getter. Hey, 28lbs with an 8-speed hub and fatties is very cool, I think. Opens up questions about putting these on light road bike. I always wondered how that would feel. This looks like a very careful build. Did you find the Shimano hub easy to adjust? I have a lot of experience messing with SA but not so much other brands. Every time I see a Shimano hub it seems there is yet another new way the shifter cable comes in. This particular hub looks fairly clean, no plastic shifter box. Man, if that braze-on was just a few inches further out, you could just plug in into that! I think you should move the bell to the headset spacers, drill/tap them. 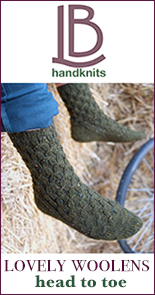 It will look awesome, break up the long neck visually and be much easier to use too. I would use a shifter boss cap with the barrel adjuster removed to cover the left DT boss. That would make it symmetrical with the right side. FYI I've added a paragraph toward the end comparing the Buena Vista to other current-production mixtes I've tried. "I'm guessing the loss of momentum on hills had more to do with the 42mm tires than with the frame geometry or hub gearing." Definitely not. These tires are famously fast. somervillain--how do you like the VO-built wheels on their rims? Installing a VO porteur case is not for the faint of heart, and I don't generally recommend it, since there are too many variables that will generally preclude it from working well on 75% of bikes (chainline issues, crank arm issues, BB issues, etc...). And when it does work, clearances are very tight. Personally, I don't care for the appearance of the case on this bike, and I also have a genuine vintage aluminum French chainguard that I considered using instead. However, Mrs. 'Villain has never licked chain guards, and they rarely protect your pant cuffs from getting chain grease on them (and I agree with this). So the choice of the porteur case was made strictly as a matter of functionality. 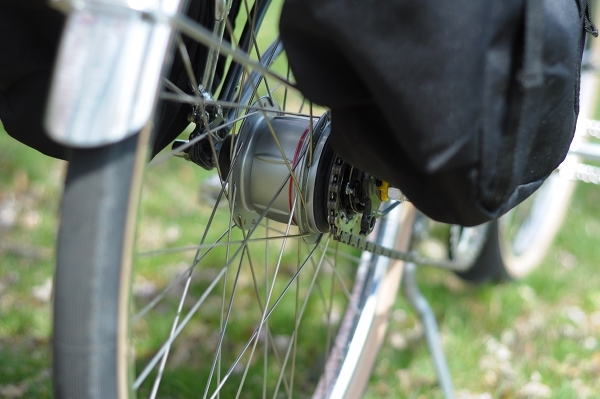 MDI- The Shimano hub makes it easy to inspect and adjust the cable: in 4th gear you look for two yellow lines to line up. 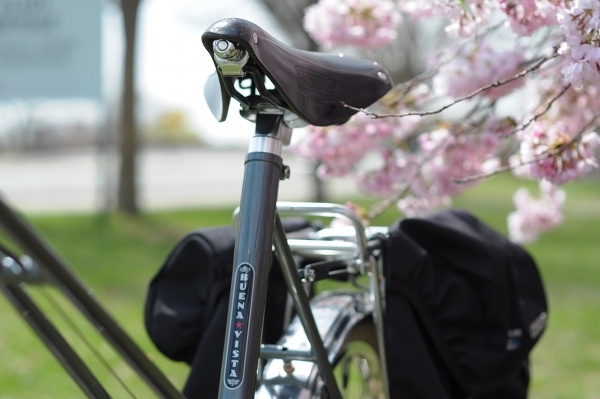 If they're not lined up, simply use the barrel adjuster on the shifter or cable stop to adjust. You noticed about the derailleur braze-on. Yeah, I SO wanted to use it, but the cable housing angle would have been way too sharp. I had to find a vintage cable stop to work there; they're impossible to find new. The steerer tube actually came taller than what you see-- I cut it down about 1cm, and may cut it down further once Mrs. 'Villain settles in and fine tunes the fit. The stem is designed to be used in either direction: note the laser etched insignia is represented in both directions! This way, if we cut the steerer down and later regret it, at least we can flip the stem for a few more cm of rise. I do like this particular orientation, as it is closer to the classic "7". Moving the bell to the headset would definitely make practical sense. I may look into putting the other cable stop on the DT braze-on and see how it looks. Adam: I agree with Velouria, it's not likely to be the tires. It may be the hub, as well as the riding position. This hub is known for not being particular efficient in some of the lower gears. There is definitely mechanical resistance that may contribute to the phenomenon that Velouria described. (For the record, I wanted Mrs. 'Villain to go with a derailleur setup, but she really wanted the IGH + porteur case). MDI: The VO-built wheels are okay, and I'm guessing they're machine-built. They are not as well built as a hand-built wheel from Anthony King, or Peter White, or any of those guys who have been building wheels for ages. Then again, for the price, it was definitely worth it (both wheels were 20% off). I put them on the truing stand and re-tensioned them slightly before putting them on the bike. Somervillain - Neat, I think the chaincase looks good! What don't you like about it? I too have heard that in practice, these are almost impossible to install, as chances are they will conflict with something or other on the bike. Glad to hear you were able to overcome all of this. As far as you know, is there a modern crankset that will accommodate it? Probably Sugino RD2 track with ring moved to inner position should work as well as this? V: I think it makes the bike too "busy", and it's monolithic. Perhaps if it were painted to match the bike, it would blend in more and be a little more inconspicuous (that was my plan with the Jeunet, but even on a REAL French bike, I had chainline issues that precluded it from working). V and M: For any crankset to work, the ring has to be moved to the inner position, as MDI notes. But the other major criterion for a crankset to work is that the gap between the spider and the arm be sufficiently wide for the case to fit between, leaving a couple of millimeters on either side. If the case is too close to either the spider or the arm, it may scrap as you pedal, especially if the frame or crankset flexes under hard pedaling. 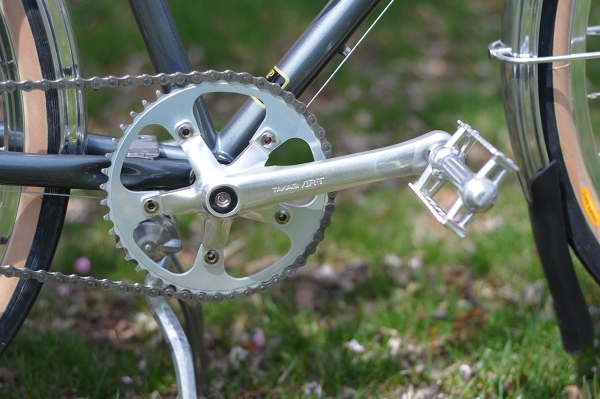 I test-fitted three vintage cranks, and only this one worked, with clearances that I felt comfortable with. The Q factor is 164-- not too bad, and there certainly are triples out there with much wider Q factors, so I think I got lucky with this one! B17: remember that Mrs. S has much longer legs than V. The seat post is all the way down for V, but normally it is positioned about 4" higher. Mrs. S will not be as upright as V. She may also want to lower the bars eventually... who knows. We also happened to have this saddle in my parts bin, and may consider the B67 as you mentioned if the B17 is not comfortable. Dropout spacing: Soma thought this one through, it's 132.5, so it can accommodate either a road hub (130mm), an IGH (132mm), or a mtb hub (135mm). Brake mount: I believe the brake can be mounted in either orientation, which is probably why they chose to located the cable stop openings in the center of the stays. I briefly considered mounting it "upside down", but felt that the caliper would look funny that way. Functionally, it doesn't make a difference either way. This is a nice looking bike, and those fat tires would seem to be very comfortable on rough city streets and/or hauling a load. Thanks to Somervillian for sharing it with you to review. The Brooks B17 seems out of place on this 'upright' riding bicycle. Maybe a B67 or other would be more appropriate. The pedals look nice enough but I prefer a cage that is curved along the outside edge for safety reasons. FIRST) When cornering with the inside pedal low, if you get pedal strike on the low side, a curved cage is just going to scrape along the pavement, where as a squared up outside edge of the pedal may bite into the pavement. May be an issue with a lower set-up found on the 650B's. SECOND) If your foot slips off of the pedal (when wet maybe), as you are pushing down, there is a chance of tearing your ankle up pretty good. I have a buddy who did just this and cut through a couple of tendons which required ~ 25 stitches and more than a few months of healing. A real mess for just slipping off of the pedal! "Man, if that braze-on was just a few inches further out, you could just plug in into that!" I noticed that right away. Good 'heads-up' for frame builders out there to locate braze-on's to accommodate both types of gear changers by just moving the braze-on a bit. Building to accommodate multiple set-ups is a clever trick! I'm wondering if the rear drop out spacing could also accommodate a hub that was both internal gearing as well as internal drum brake. Are there considerations to make when sizing for that? Or is there a standard 135mm ...140mm spacing in the back that frame builders and component manufactures know and build to? Nice bike for an Easter Sunday drive (virtually or really)! Are those the blossoms of a Cherry tree I see in the photos or maybe a Crab Apple tree? We don't see much of those in Southern California! Re the B17: The one on this particular bike was nicely broken in, so it was okay for short distances, but did start to hurt after mile 10. Even on my own mixte though, where the saddle is level with the handlebars, I don't find the B17 comfortable and have the B72 installed. But not everyone feels that way - plenty of mixtes out there with B17 saddles and narrower. Mrs. S has had lots of problems with saddles in the past, so some experimentation may be necessary here! This is a very tasteful build; the mud flap gives the bike a rando street cred. I have that bell, formerly on my stem mounted to a spacer, but it dinged so much over rough roads I had to take it off. Kids from all over would run towards me, expecting ice cream treats. The bike has a light quality to it in contrast to the chaincase. If Mrs. SV ever gets tired of it there are those plasticky black chain condom thingies that look like a belt that are supposed to be fairly quiet. SOMA is local to us and good peeps; Mrs. GR is friendly with them. Odd name, though - their world HQ is located somewhere in the fog on the head badge, whereas the SOMA neighborhood is in a different biosphere entirely. The fog flowing over Twin Peaks on the head badge juxtaposed with the frame's model, Buena Vista, is one of those ironies the locals and tourists recognize all too well: where's the view after all? I use the Nexus 8 and 42mm Hetres on my camping bike. The Hetres are pretty decent climbers, imo. They're pretty special tires. The weight of the Nexus 8 does make hills harder, though--at least for me. Velouria--As for the gearing range, you can use Sheldon's IGH gear calculator and swap values for the rear cog to find which gives you the gearing you want. SJS in the UK has a nice selection of cogs for the Nexus 8 if you can't find anything locally. Overall, the gearing range will always be relatively limited for the Nexus 8, but at least you can get the gear inches/ratios you want. I run a 46/23 on my camping bike. It gives me a low low, but also a pretty low high gear. That's okay, as the top-end gearing isn't so important to me on a camping bike. $1200 for a complete bike and not a dime for a chain guard?? 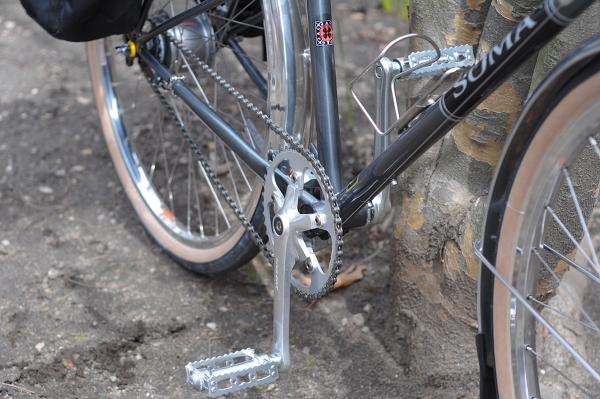 A question for somervillain: Why use a cable stop on the chainstay at all? On my wife's mixte (not a soma...) I just ran the bare inner cable straight from the bottom bracket cable guide into the cassette joint guide. The rub of the cable on the cassette joint is pretty minimal, and a piece of cable housing liner would alleviate that if one is so inclined. Lee - It's not the gear range, but the fact that I find myself switching gears way too much within the range, if that makes sense. GR Jim said "their world HQ is located somewhere in the fog on the head badge, whereas the SOMA neighborhood is in a different biosphere entirely"
I would argue that the view of the Sutro tower on Twin Peaks is what you SEE from SOMA. This was similar to my view of Twin Peaks from where I used to live in Duboce Triangle, very close to SOMA. Those fog banks tumble down, but rarely make it all the way down to the sunny side of town. I love that head badge, and it makes me miss my former SF home. OKB - pedal strike with MKS touring pedals is not an issue on this bike; the bottom bracket is sufficiently high even with the 650B conversion. Aside from that, I would argue that curved road pedals are not the best choice for a bike that is meant to be used for transportation. Even for those worried about pedal strike, there are other choices, such as the narrower MKS Stream pedals and the quite narrow VO city pedals. Just wondering how tall you are/what you normally ride? I'm getting ready to build up a buena vista for my wife, but I can't decide on the 54/58 frame. She is quite tall (5'9"), but prefers a more upright position. Any input? It will have 700c rims. Thanks! 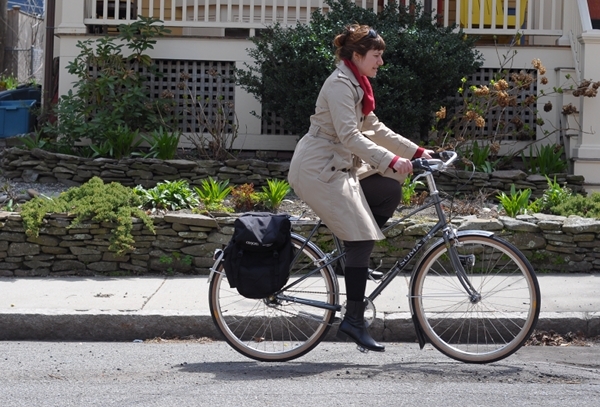 Anon 4:41 - I am 5'7" and normally ride a 54cm mixte (if measured c-t as Soma does it). At 5'9" your wife should definitely get the 58cm frame. 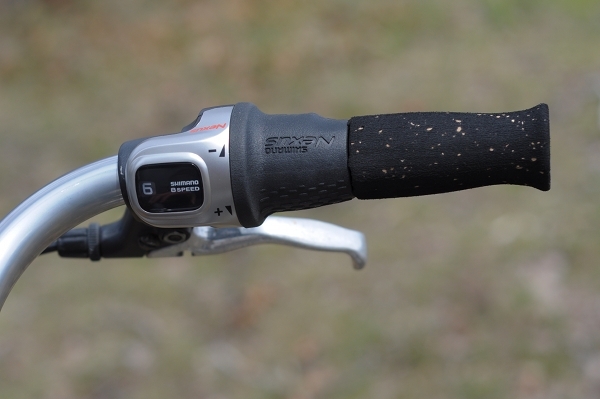 You can set the handlebars as high as you like using the large spacers. Okay. The reason I ask is it seems the virtual top tube is quite long on the Soma vs other mixtes so I didn't want to run into problems there. I was originally going to build up a cross check for her and was considering the 54 there due to the long top tube, but I guess with the mixte there is more room for error on the large end since I can add spacers and will likely use bars the head backwards (sparrow, albatross, etc.) vs. drops. Thanks for the comments! Oh yeah, long tube is AWESOME for city bars like some dove and albatross, etc. They go way back and would poke me square in the gut as I try to turn if the stem/toptube aren't long enough. As a very happy owner of a Soma Smoothie ES, it's great to see one of its sister frames reviewed here. Interesting comment about 650s eliminating toe overlap. I don't think I had ever experienced it on earlier bikes, and hardly ever with my Smoothie ES, until soon after a post on the subject here! And I did it a lot (relatively speaking) during my first extended city-biking (Washington DC) tour. Brandon - Has she test ridden the 54cm Surly Cross Check? Here is me riding one. IMO it would be too small for someone her height. 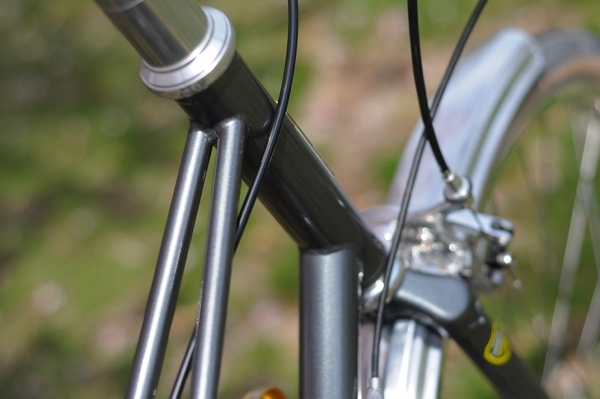 And I agree with MDI that Albatross bars are perfect for bikes with long top tubes. Thanks so much MDI and Velouria. She has not test ridden one, but based on my calcs I thought it would work best. Knowing your size and seeing you on that I think a 56 cross check would be better. It's hard because you go into the forums and it's all dudes and I think we tend to like throwing the seat up and being stretched out into the drops is best. But I know this wouldn't be ideal for her. So I can't tell you how much your input helps. I now feel totally comfortable buying the 58. I want to build this up as a surprise which is why I'm trying to work this out without heading to the LBS. Thanks! Great info! I also want to purchase one of these for a fast road build, but have been undecided as to size. With a height of 5'9" and an inseam of 34", I'm all legs. I feel most comfortable on a 22" (56cm) frame, but can ride the other half's 24" frames (equipped with on one Mary bars) if I stretch out, which is less comfortable. Since I want to use the Lauterwasser bars, I've been leaning towards the 54cm model, but am worried it will be too small, while the 58cm model may be too large. Input, anyone? Very very interesting. I will be building up my Velo Orange mixte frame this summer, so I really can't get enough of the mixte build posts. Thanks for sharing this one. Kirsten, there are too many variables to know for sure. You need to know exactly what the top tube length is on your 56cm, then your stem length, then the distance from the end of the stem to where you like to put your hands on the bars. It looks like the 54cm Buena has a 56cm top tube, but chances are the Lauterwassers are way different than the bars on your 56, so that throws everything off. Cheapest way to determine your frame size is to get the Lauterwassers, put them on your 56 and fiddle with them until you’re comfortable. Then measure everything to get top tube and stem lengths you prefer. If you’re building the fast road bike to go long distances the Lauterwassers may not work well due to not having many positions to put your hands. In town trips they’re probably fine. I love the new Lauterwassers re-release, but as GR Jim points out, their practical application is limited. It's like building up a long distance bike with track bars: they may be beautiful, but there is nowhere to keep your hands but the drops. If you want something aggressive-ish and vintage looking, I recommend mounting some Albatross bars upside down and covering the entire bar with tape, like this. Though, I have to admit to a bit of jealousy when I see so many beautiful bikes built up for people's wives. I guess one of the downsides to living alone is that there is no one to build lovely bikes for you! Hopefully all the recipients appreciate the work that goes into these presents! Thanks V. & GR Jim. Looks like I'm in for some experimentation, but should be fun and informative. Mark: What a great idea, I hadn't thought of just running the bare cable right into the hub cassette! I may try that. neighbourtease - Has your VO mixte frame been repainted yet? I am so curious to see the result! Of course, I have seen photos of Somervillain's other bikes and would expect nothing less. I'm curious about how this frame stacks up to the VO mixte. Velouria, your comments about the Shimano IGH got me wondering about how a cassette, hub and rear derailleur weigh compared to an IGH. When you pick up a Sturmey-Archer 3 speed for the first time it feels like it weighs a ton. Then again, a cassette/multispeed freewheel has some mass as well. "Lee - It's not the gear range, but the fact that I find myself switching gears way too much within the range, if that makes sense." Velouria--What I mean is you can calculate the gear inches for those gears you use a lot on a derailleur-equipped bike, like your Sam H. Then, try to find a cog/chainwheel combination for the Nexus 8 that gives you some of those same gear inches options. For instance, from riding my single-speed and derailleur bikes, I know that I like 44 and 54 gear inches for hills and rollers, and 66 and 72 gear inches for my normal cruising gears. 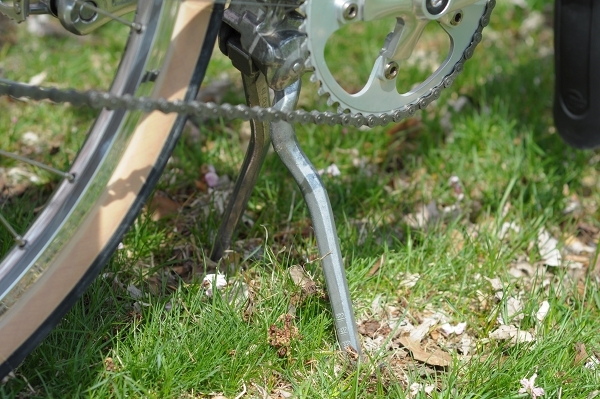 So, after some calculating, I decided to outfit my Nexus 8 bike with a 46-tooth chainwheel and 23-tooth rear cog. That gives me 44, 52, 64, and 74 gear inch options among the 8 gears. Not exact fits, but not too different feeling. So, if you have an IGH bike and you don't like your gear choices, you can change the size of the cog or chainwheel you are using to get different gear inches options. Cogs are cheaper than chainwheels, so I would look to change that first. Lee - Is it weird or unusual that my preferred gear inches differ depending on the bike? For instance, knowing my ideal gear inches on the Rivendell is not helpful for figuring out my ideal gear inches on my more aggressive fixed gear roadbike, and equally unhelpful for figuring them out for an upright bike. I find that I have to experiment for each bike in its own right, unless we are talking about near identical bicycles. But moreover, I still don't understand how this applies to what I am experiencing with this hub. Are you saying that my ideal gear inches for this bike happen to be in between the gears it gives me, and replacing the rear cog could fix this? I don't think that's it. For example, it's not as if I feel a " the 5th gear is too low but the 6th is too high" sort of thing. It's more like the gears don't feel as "versatile" as they do on other bikes. Whereas on another mixte I could cover the same mildly hilly route in a single gear, on this bike I switched between a range of at least 3 gears back on forth on the same route in order to cycle as comfortably. That does not seem related to gear inches, but more to an inefficiency of some sort. 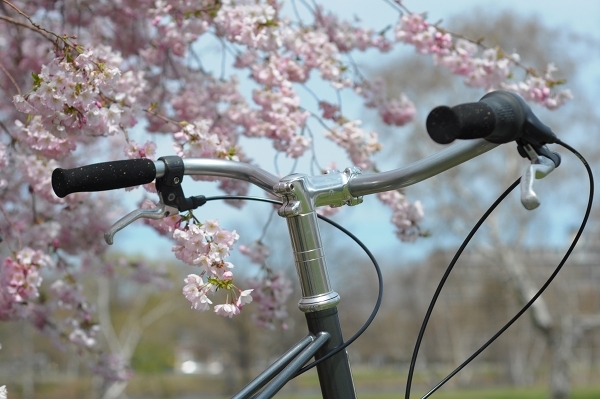 it could simply be that the bike was not set up properly for you during your test ride. handlebars too high, seat too low, or the relationship between them not quite right. maybe that could create an inefficient feeling. ? The handlebars being too high was my initial theory. But then I looked at my Riv Betty Foy testride pictures and the setup is pretty similar: I also shoved the saddle down without bothering to lower the bars. Yet I did not experience the same weird gearing thing with that bike. So I have two possible hypotheses: Either it's the hub gearing, or there is something specific to the Soma's geometry that becomes rapidly less efficient with upright bars, whereas Riv's geometry does not. A combination of both could of course be the case as well. 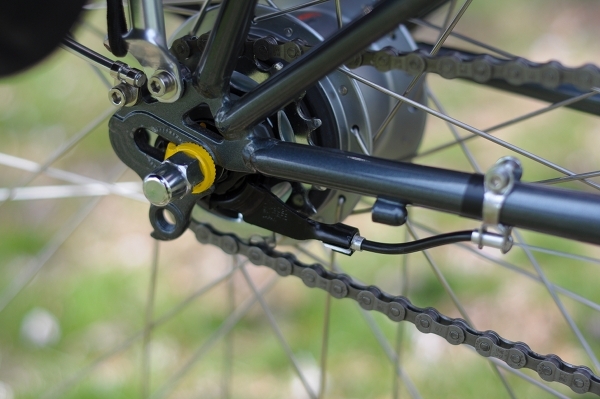 Different bikes have different efficiencies and require different optimal gearing. That you had to shift a lot means either the bike or your position isn't as efficient as you Royal. I'm tired but maybe tomorrow I'll write some more on this. 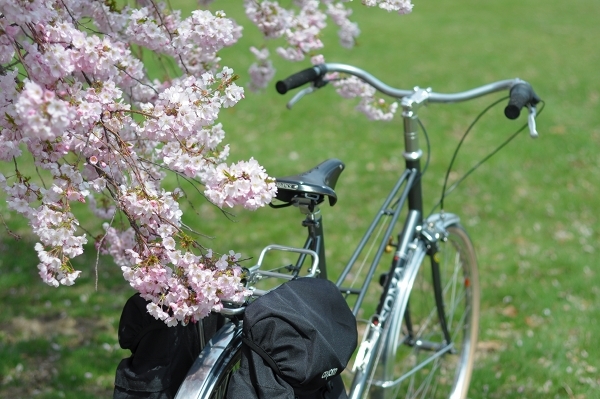 Hmm... Maybe you could accessorise the bike with cherry blossoms. It sounds like this bike is what the Trek Belleville pretends to be, or what people who don't know any better might think they're getting when they buy it. Velouria, as per what you say about the Lauterwasser, I cannot ride track bars for more than about half an hour. I sometimes ride my fixie for longer than that, which is the reason why it has road bars. V, I haven't had it stripped yet. I'm still deciding between having it chromed and a couple of colors. I will definitely send photos! But I think these things might account for Velouria's experience of not being able to find the "right" gear when she wanted it. "Are you saying that my ideal gear inches for this bike happen to be in between the gears it gives me, and replacing the rear cog could fix this? I don't think that's it. For example, it's not as if I feel a " the 5th gear is too low but the 6th is too high" sort of thing. It's more like the gears don't feel as "versatile" as they do on other bikes." Velouria--Yes, that's what I was saying. But I realize now that that's not what you were experiencing! Sorry for taking the discussion off on this tangent, then. "It sounds like this bike is what the Trek Belleville pretends to be, or what people who don't know any better might think they're getting when they buy it." Yes, I think that is a fair way to describe it. 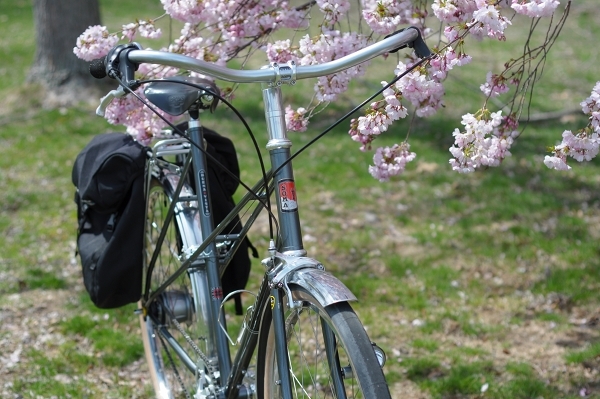 The Soma is an economical, welded version of a classic lugged mixte. But it is well made and I would be hard pressed to find anything critical to say about its quality or geometry. "I'm curious about how this frame stacks up to the VO mixte." The VO mixte is (or was, since it's now sold out) a fully lugged classic mixte frame at the same price as the Soma. To me, that makes it a more desirable frame. But I do not know how it handles, what its clearances will allow, etc., in comparison to the Soma. I am pretty sure the VO mixte will not allow for 650Bx42mm tires for instance, so for those who want that specifically it would not be the right bike. "I really think it's the hub in this case-- others have reported that, while the 300% gear range from low to high is great, the spacing between the gears is not evenly distributed, so it's hard to find the right gear to match your preferred cadence as you speed up or slow down. In addition, there are mechanical inefficiencies (i.e., drag) that are worse in some gears and better in others..."
This is very much in line with my experience of 7+ speed hubs, and the reason why I do not like them. I do not feel the same inefficiencies with 3 speed hubs, and I do not feel them with derailleurs, so for me those are my two preferred gearing methods. I am curious why what you are describing is not more widely acknowledged. When I mention that I prefer derailleurs for touring, a very common response is "Ah but you can get the same gear inches on an IGH, you don't need a derailleur for touring!" If there are inefficiencies that limit the actual performance of the hub, then I feel it is misleading to compare a hub's to a derailleur's gearing by merely comparing gear inches. I'm a little confused by your statement, "While a 58cm frame is usually too big for me, I was able to fit this one because of the 650B wheels." I would assume (maybe wrongly) that standover height is not an issue on a mixte. Otherwise, nothing about the fit changes with the swap to 650b. I usually consider the "cockpit" to be the most essential fit variable, both in terms of toptube length and seat/handlebar height relationship. Were you using "fit" only in the broadest, "I can technically ride this bike without killing myself" sense? V, I agree completely. The key thing here is that Mrs. S wanted an IGH for convenience, and I of course insisted on one with at least 300% range, since you are well familiar with the hills near our house, AND the fact that this bike will be pulling a trailercycle. Aside from a NuVinci hub which would have nearly doubled the price (and weight?) of this bike, this hub was the ticket, all shortcomings notwithstanding. Mrs. S already has a Sturmey Archer 3-speed hub on her Dutch bike, and it's adequate for casual cafe hopping and date nights, but other than that, the bike sits unused, largely because of the gearing limitation. One comment in Shimano's defense: they even state in their product literature that the hub needs time to "break in", during which time you may feel and/or hear mechanical noises (which I definitely felt/heard). I suspect that the hub is built with much greater precision and tighter tolerances than an SA hub, and it may need to actually wear in a bit to become more efficient. This is similar to a modern car engine, which becomes more efficient after the initial break-in period. Erik - seat tube length. Look how low I have the saddle. If the seat tube was 2cm longer, I wouldn't be able to get on and off. I think the inefficiences amount to something like 5-10% of your pedaling work lost with some hubs as opposed to 1-5% lost with derailers. It's possible that some hub gears are worse than 10%, of course, I heard that not all gears in a hub are equally efficient, but don't recall who, what, or where. I've seen some of Sheldon's hub gear info spreads, as well as manufacturer charts and it seems that many hubs have reasonably spaced gears and some have nearly exact percentage changes in gear inches from gear-to-gear. So while I don't have a full explanation, my guess is that gear hubs are generally put on bicycles that also have a particular geometry. I think your body's position when pedaling is the single most important factor, overruling bike weight and hub/derailer differences. I think if we hypothetically replaced the Bianchi's rear wheel with a hub, or the Hillborne's you would not feel much difference in how these bikes perform on our usual routes. 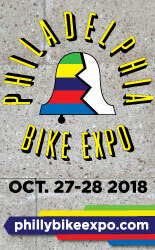 "I'm curious about what Velouria, Somervillain and others feel would be the pros and cons about setting up this bike with a 3-speed SA hub vs. (e.g.) a double derailleur (e.g. 8 x 2 or 9 x 2?)" The frustrating truth is, that we just don't know without experimenting. I've ridden my Bella Ciao 3-speed to places like West Newton and Lexington - which are fairly hilly areas outside of Boston - using only gears 3 and 2. I've ridden through the same areas on the Mercier and Motobecane mixtes I used to own without switching gears at all. And I've attempted to ride to the same areas on my Pashley (which had a 7-speed hub), but it was truly horrible. My instinct tells me that lowering the handlebars on Somervillain's Soma and sticking a 3-speed hub in it would improve its performance by making it both simpler and more efficient. But the idea of a 3-speed hub feeling better than an 8-speed is so counterintuitive, that I would not expect anybody to actually spend money on doing something like that. An 8x2 derailleur would of course be great as well (as would a 1x8). But if Mrs. S wants an IGH city bike for easy maintenance, it would sort of defeat the purpose. Also, everyone's situation in unique and the Somervillains live on top of a hill the steepness of which is formidable. It's a brief, but basically vertical hill. I think that while an 8-speed hub may be not the most efficient set-up overall, for that hill specifically its lower gears will be quite useful - and that may very well outweigh the other inconveniences. Yes, I see what you mean both about the need for experimentation and the specifics of what Mrs S wants/needs - the IGH for convenience in a city bike, and a low range that can cope with the local hill! But that's a helpful analysis of some of the considerations. Thanks! Re: IGH inefficiencies - I have a feeling that those who ride IGHs don't care about outright speed, or don't know what a faster bike feels like so it's ok or just don't want to deal with derailleur maintenance. I recently rode a transport bike I bought for my brother because it has all the cool stuff: hub generator, IGH, blah blah. It's got a very stiff, efficient alu frame. It felt like riding through sand, there was so much drag. The other main mechanical inefficiency is the frame. You are comparing a $400 mass-produced item to your, I'm guessing, over $2k very carefully built magic carpet ride with very specific hand-selected tubing, brazed and aligned to very tight tolerances. As a general comment with some applicability here, though you might think you're in the same position while comparing A to B, most definitely you aren't. When you get hooked up to a giant Retul machine that measures your power output with sensors all over your body that measure angles, you realize very, very minor changes effect how much power you can create. Things like a 5mm saddle adjustment in height or setback can make your effort less taxing. I remember the owner of VO discouraging someone on a comment thread from putting 650b tires on the VO mixte (mmmm . . . sacrilicious, I would say), so perhaps it could have them, though maybe not so wide as the hetres. I am going to use 700c on mine because I personally prefer how they look on a very classic mixte. I knows, V has that on her mixte. I saw an article in Bicycle Quarterly about the energy output needed for different versions of the 8 speed IGH. It quoted data from Shimano plus some BQ measurements. If nobody comes up with the reference before then I will post it when I get home tonight. I'm looking for an IGH solution for next winter commuting. This year did me in for derailleur/chain maintenance. Harris recommends not using the 8 speed due to freezing grease lubricant. That leaves a three speed or the new 11 speed, both of which use oil. The three speed is a problem for my fitness and knees, I need to spin. The problem is I would very much like to see some experience based reviews of the 11 speed. It is an expansive experiment. Anyone using the Shimano 11 speed IGH? RJD - I could be wrong, but I remember ecovelo had a post about the Shimano 11 speed IGH, with some owners chiming in. Can't seem to find it. Regarding IGH inefficiency: Though I love my NuVinci N360 and find it indispensable for everyday cycling in all weathers, there are some days when it feels like I'm slogging through quicksand. But to me, the utility outweighs any inefficiencies. Others are fully entitled to their differing opinions. Kirsten - for a bike that is meant to be used as an urban transportation bicycle, I agree entirely. Looks like your wife is going to be really happy, that's a great build. As usual a great review and critique by Veloria as well. Thanks, Marc. You know where I got my inspiration for this bike :-). FWIW Mrs. GR would have an IGH if she didn't have a designated muck scraper - me. I enjoy restoring it on a periodic basis. Plus she gets to experience the New Bike Feeling every few months. "Erik - seat tube length. Look how low I have the saddle. If the seat tube was 2cm longer, I wouldn't be able to get on and off." I guess that I just don't get how the change in wheel size affects this. When I get on and off, it is by standing on the pedal, and lifting myself on or off of the seat (with the height from pedal to seat remaining constant independent from wheel size). In the past, you've mentioned that you have a curious mount/dismount style, so this must be the difference. Oh well...the thread seems to have run away with IGH discussion, anyhow. Erik - Not everyone can mount a bicycle in that manner. Some need to be able to reach the ground with the tip of a toe in order to feel comfortable stopping and starting. I, for one, am of that category. Smaller wheels lower the bicycle's minimal saddle height. Erik-- the 650B wheels with 42mm Hetres lower the bike about 9mm compared with 700C wheels with 32mm tires, the maximum width tire you can fit on this bike. But nominally, the bike was designed for 28mm wide tires. Therefore the bike as built up sits about 5mm lower than it was designed to. To be fair, for the 5-10mm to matter your saddle has to basically sit on top of the seat tube, as it were. If you have 1-2" of seat post showing then all is well if you go 650B->700C and back. I think the coolest thing about 650B conversions is that they have virtually no theoretical drawbacks, only positives, except for the "cost," which does not apply to new builds. The only problem is if you're already invested into a 700C build--expensive wheels, fenders, etc. I'm buying wheels for the white buena vista (in 58cm) I bought yesterday. Anybody have comments on 700c vs. 650b beyond standover? Specifically would the women on here prefer one over the other? I'm leaning towards 700c so the wheels are compatible with our other rides, but thought I would ask. Thanks again! 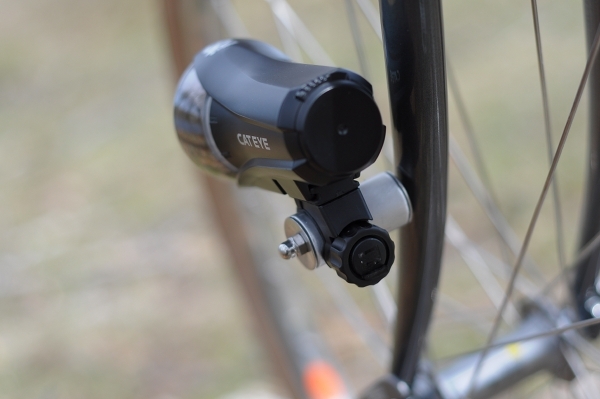 I love that Spanninga Pixeo light - I tried a bolt-mount from cateye on my Raleigh's fender and it just didn't work (it was fine on the rack), but this one is designed just for that purpose. I wish they were still in-stock on VO and came in a retro version. I'm with Velouria on the mounting issue. I can't have one foot on a pedal, push off and swing onto the bike like so many others do. I have permanent injuries that keep me closer to the ground. I just got a Gazelle Champion Mondial mixte with 700X23c wheels and I love how low the seat can go. Yay for squaty frames. I see the blog has moved on to more philosophical subject matter, but as promised here is the Bicycle Quarterly reference to Shimano 8 speed IGH performance: Autumn 2010 issue, page 69 documents increased resistance in the indirect gears, especially 4th. Thanks for that info, I do not have that issue but might order it. Ah, I knew I saw it somewhere, and that's it. I will scan it and post tomorrow. Since 5th is direct drive and has less resistance, the point of that graph was to illustrate how it may be easier to pedal in 5th rather than in 4th when you'd rather be in 4th because the overall output is more efficient in 5th than in 4th. This is what I was alluding to above. Ah, and to further explain my uncertainty as to where I saw the graph: it's in BQ, but it's an official Shimano-supplied graph. Interesting, it shows exactly what I had mentioned above about 5th gear being the most most mechanically efficient due to that gear being direct drive. The lower end Alfine hub shows the biggest efficiency drops in the other gears, while the Nexus red-band hub shows much smaller efficiency drops, due to the use of higher quality needle bearings. -in the case of 700c frames that are already designed for fat tires, the BB drop may be too low, and brake reach may become a hassle. This is not the case with smaller-clearance 700c frames. Re: IGH inefficiency: for the most part, IGHs are used for practical transportation cycling, and not racing. The little bit of mechanical inefficiency in an IGH is not the sort of thing that a commuter can seriously gripe about. I suspect SV has it right when he mentioned that the steps between the gears are too wide for V to have found a sweet ratio for the climbs. Luckily, you can get both straight and dished IGH cogs in sizes from 13t to 25t (although, I've yet to see a 24t. just 13-23, and 25t) for about $6 each. The old conventional wisdom is that you don't want the direct drive gear to be less than a 2:1 (eg, a 46t chainring and a 23t cog), or the torque might fry your IGH. (A fellow on bikeforums claims that he's been running an alfine 8spd in various super-low combinations off-road without issues for over a year, so perhaps they're getting by that problem.) Shimano's 8spd IGHs give a 15.2% jump between shifts, but this will translate to fewer gear-inches between with a lower direct-drive ratio (ie, the chainring and cog are closer to one another in size.) So, you can gear the bike for less overall range, but with less of a gap between gears. Do ppl bemoan the "mechanical inefficiency" of IGHs? Sure. And, when racers were looking closely at Rohloff SpeedHubs, those complaints made sense. But, really, if you're riding to work or riding for fun, IGH inefficiency shouldn't even be on your radar. For those purposes, it's no big deal. Please read the description with this photo! First thing I go: what are the values of the y axis? Then Jan goes nuts to say the same thing. I'm sure the presence of real values is too damning so Shimano wisely kept them out. GRJ-- I didn't read Jan's comments, but I see that I am not alone in coming to the conlusion that the data, in and of itself, has no meaning without knowing not only the units but also the numerical range of the y-axis. But if real numbers are damning, why would Shimano have published this information in the first place. My reasoning is that less technically savvy people would automatically interpret that graph in the most damning sense-- the natural assumption is that the y-axis represents the widest possible range, i.e., 0-100%. SV - My take is if the y axis were at 100% of total drag the peaks and valleys wouldn't be as noticeable but their baseline isn't where optimal efficiency is: at 0%. Naturally, curious folks will want to know how their derailleur set up compares. Cat is then out of the bag. Mostly I think IGH tech is at its infancy. The chart and peoples' experiences show there is variable resistance depending on what gear you're in. The last thing I want to know is if I drop down one gear on this long climb I will be easier because it's lower, but harder because that gear has more drag. Shimano engineers: "They don't need to know how much drag there is; let's just draw this simple graph. No need to add fuel to the fire." I guess it's useless without a range, we could be looking at a graph of 90%-95% or 50-100%. But reading some of the comments here and elsewhere is beginning to plant seeds of doubt into my hereto held view that Shimano hubs are relatively efficient, at least in the 90%s. Oh, well. All I can say is that my 5 speed SA hub has a direct drive in gear 3, which I use for 90% of my riding so I almost never feel any inefficiency. When I switch to 4th, I can go much faster but at a penalty of getting tired, but it still does not feel less efficient. Gears 2 and 1 I use on hills--which is to say rarely. So I mostly stay in 3 and occasionally 4. And 5 is useless to me. Too high for anything except downhill. I'd just change the cogs, but I don't want to lose my 3rd direct drive--it would be too low. So in actuality, my 5 speed hub is really a 4 speed hub: 1, 2, 3, 4. And if I am brutally honest, the 2nd gear is pretty useless. It's rarely low enough for a good hill and way too low for riding against the wind. So my hub is really a 3 speed in all practical sense: 1, 3, 4. Queue in V's love of 3 speed hubs and indeed the gear distribution matches that of my favourite gears. Weird, huh? I'll have to think about it some more. Of course, nothing, nothing touches the convenience of my hub (and others like it) in the winter. I have ice all over my rims and spokes and stuck to my wheels, but the hub works and brakes as well as in the middle of July. Todd's comment on SV's link should basically be the wiki entry for IGHs except for this: "Drivetrain losses pale in importance to aerodynamics above a certain modest speed, and rolling resistance is also usually more important." I agree with this in principle, but losses due to frame inefficiencies can be substantial. Additionally, while climbing some drag forces like wind resistance become less important, though still very much so, and others like hub drag become more so, as Todd inferred in the paragraph on climbing with an old IGH. Somervillain- which VO fenders were used? Neighbortease- "sacrilicious" I love it. Did you coin that? I'm totally stealing it. well i just finished putting together a 58cm in white with a honey brooks saddle, albatross bars, shellacked cork grips, etc. i was going to post a pic but don't see how. anyway, thanks everyone for the input. my wife loved it. Branson - Thanks for the pictures. It looks like the bike is just the right size for her, very glad it worked out! kiwigem-- fenders are VO's 58mm fluted fenders for 650B. but I would want fenders. I know that the conversion would need new brakes (which I already have from a previous project) new rims, new tires, and lots of money (or failing that lots of time). Is there a way to know if it will work before you start? It's fine as is. It rides really nicely for me but long term I would really like the fenders. Somervillain- Thanks, I thought so! I have a set (and a pair of Hetres) sitting around for "someday." My LBS said they wouldn't work on my current project, but seeing them on Mrs S's Buena Vista makes me think they might after all. Did you have to "mold" the fenders a bit to make them work? Erin B: I think that Nishiki International might be a great candidate, but I'll contact you off-blog with detailed thoughts. kiwigem: I did in fact have to dimple the fenders in multiple places to make them clear the rear triangle, fork blades AND brake calipers! Practically speaking, they simply are too large for most bikes and any bike with caliper brakes, unless you're willing to bang away at them and make lots of little indents! 52mm Zeppelins would have worked without any modification. Very cool bike! I'm also going to buy it! Somervillain, what kind of grips are those? They look great (as does the rest of the bike). Anon 11:56, thanks! Those are black cork grips that I picked up at a local LBS, but I can't remember the brand.